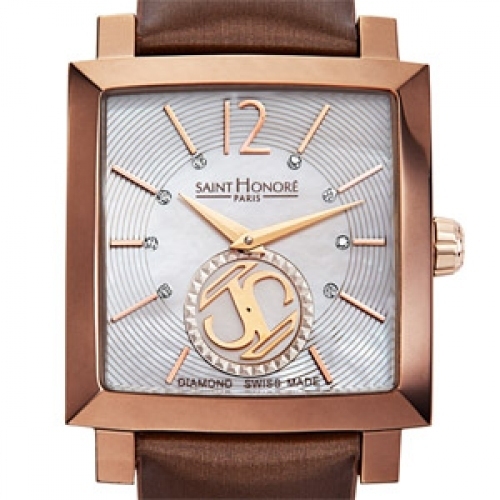 SAINT HONORE introduces a new model to its star collection that has made its mark on the year 2011 : Orsay Lady. Elegance and sensuality are the hallmarks of this precious timepiece, which appears here in its winter dress. Orsay “Bronze” is adorned with a PVD treatment giving it a warm glow that sublimates the curve of its square case. 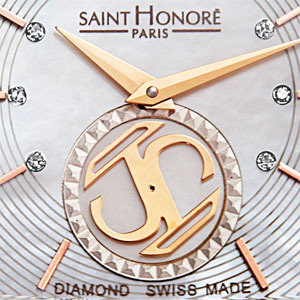 The sparkle of eight diamonds completes the picture by accentuating the hour-markers that appear to be floating on a white mother-of-pearl sea – an effect achieved by the fine circular guilloché dial motif. Lending an additional touch of glamour, the SAINT HONORE monogram elegantly marks off the passing seconds at 6 o’clock as if to emphasise the timeless design of the Orsay Lady collection. The result is a chic and trendy rendering designed for sophisticated contemporary women.